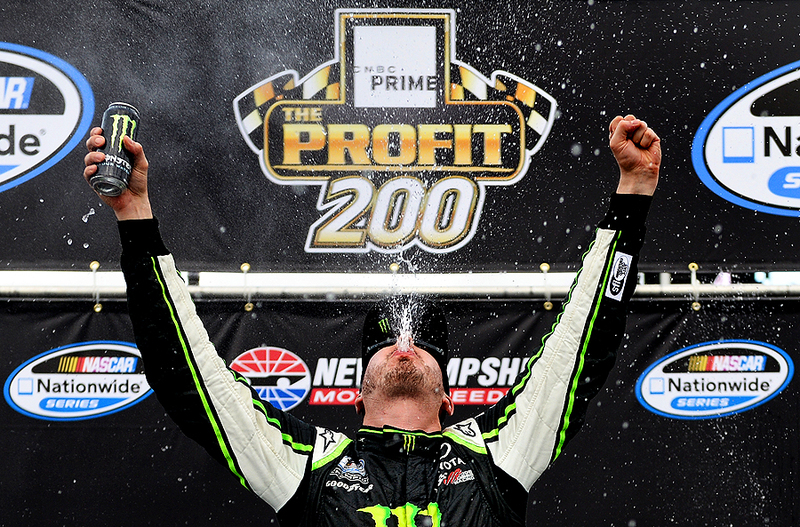 "Kyle Busch, driver of the #54 Monster Energy Toyota, celebrates in Victory Lane after winning the NASCAR Nationwide Series CNBC Prime's The Profit 200 at New Hampshire Motor Speedway on July 13, 2013 in Loudon, New Hampshire." My July schedule hasn't provided many right-hand turns, as I've been continuing coverage of NASCAR for Getty Images. This past weekend I was in New Hampshire covering a pair of races - Nationwide and Sprint Cup. My positions during the pair of races didn't allow me to shoot much side-by-side action, but instead capture frantic wrenching turning and champagne-spraying celebrations as I documented pit stops and victory lane. It's hard-work covering the aforementioned, and as simple as they may seem to outsiders, you really never know what could happen, specifically in the pits and with the burnout celebration. On the other hand, victory lane is usually straight forward. Drivers are put there to celebrate a victory, and there happens to be a gaggle of photographers in marked spots in front of them. But it's an important image that needs to be taken for historical, storytelling purposes. Nonetheless, the beauty of documenting the world is its spontaneity. Most of the time drivers jump out of the car and get drenched by their crew. There is a certain style, formula that needs to achieved when in the marked spot. Yet every once in a while, drivers do something different to keep photographers engaged. Thanks to Kyle Busch, he decided to spit his Monster Energy Drink into the air after winning the Nationwide race that provided a fresh moment in victory lane.